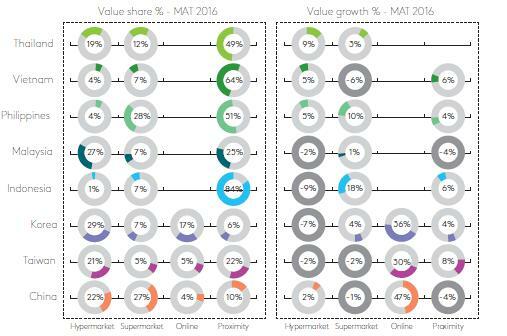 Proximity retailing will be the key competitive advantage for FMCG retailers and manufacturers. E-commerce is ubiquitous in retail these days. Despite the low single digit growth of global in-home FMCG, e-commerce shone with a solid growth globally. In Asia, e-commerce has managed to score significant shares in FMCG within North Asian markets – China, Taiwan, and Korea, even posting more fascinating annual growth. The question now, however, is e-commerce the only way to go for all players in Asia? Regardless any advance developments in digital, FMCG players should continue to keep their focus on their consumers and what they want most. Across Asia, we see that shoppers seek convenience in every aspect of their life, choosing something that makes them more comfortable or allowing them to do things more easily. Our data shows that channels that provide this “Convenience” in terms of proximity, outperform others. Proximity to shoppers is key – and with proximity, it means not only online stores (digital proximity) but also brick and mortar shops that are easy to reach (physical proximity). Supported by strong infrastructure and government support, South Korea FMCG e-commerce led ahead of the others in terms of size and growth, followed by Taiwan and China. For the rest of developing Asiancountries, however, online is still dwarfed by other non-digital channels. Despite shoppers’ yearning for convenience, there are still challenges to e-commerce progression which brings proximity to a more traditional level – physical proximity. Physical proximity, in this case, is the concept of being easily reached by shoppers and includes both not only modern convenience stores, but also independent (non-chained) minimarkets, as well as small traditional mom and pop shops located around the community/ neighbourhoods. These channels contribute biggest shares to total FMCG across all South East Asian countries, with respectable growth. 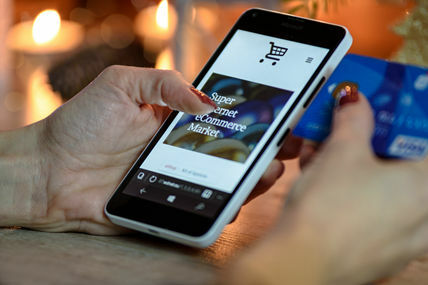 It seems that even for some shoppers in developed markets, payment, waiting time for the goods to arrive, or others may still be a hindrance for online shopping and results in the remained popularity of physical proximity. Different level of developments in every market across Asia shows that each market needs to be handled individually. E-commerce will continue to flourish across Asia– faster in some than the others. Convenience stores and small traditional formats will thrive- better/ longer in some than the others. We believe that proximity retailing, however, will be the trend to stay true for every player, to become the key competitive advantage for FMCG retailers and manufacturers alike. Deciding what card to play, when to play it, and how to play it, will then be the next question for every player to answer, depending the company’s goal, resources, capability, and its understanding of the shoppers in the market they are in.